The capability to study the metabolic dynamics of unlabeled cellular specimens continuously for hours, days and weeks is still to be exhausted. Pancreatic islets, and in particular insulin producing beta-cells, can be monitored under different conditions of nutrient supply. The metabolic measurement of beta-cells or islets can provide basic information on their viability and functional capacity in regenerative medicine. 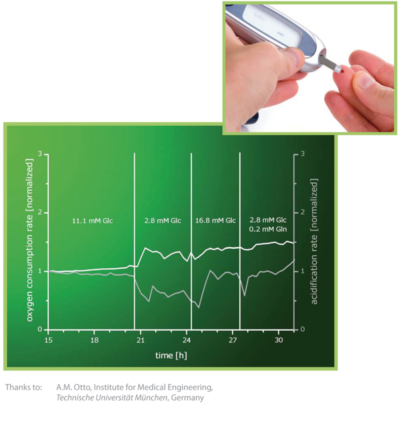 The test example shows changes in metabolic activity of the beta-cell line INS-1E when exposed to glucose concentrations mimicking physiologically low and high glucose levels in blood, i.e. under conditions which regulate insulin secretion. To investigate e.g. anti-inflammatory properties of food additives interactions between cells and additive can be monitored. The example shows the interference between an additive and escherichia coli bacteria after 9 h of interaction. 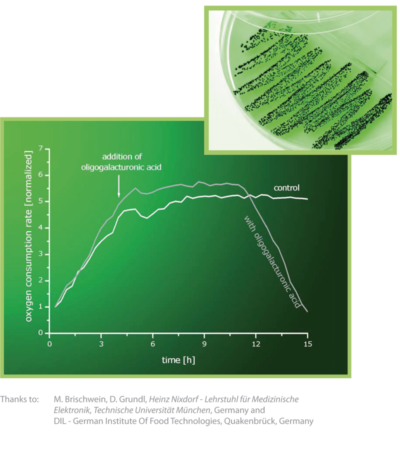 To investigate the potential of algae for biofuel production the vitality of the algae can be monitored during changing environmental conditions. 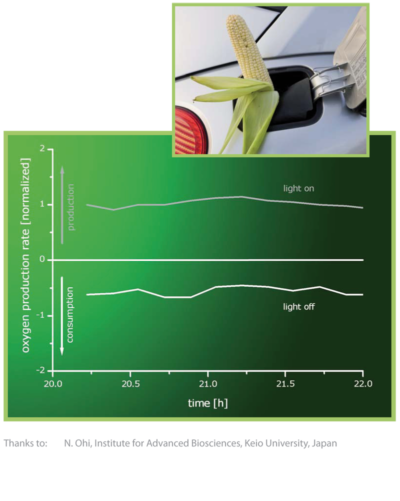 The example shows photosynthetic active algae in an enlighted environment and oxygen consuming algae in a dark environment. 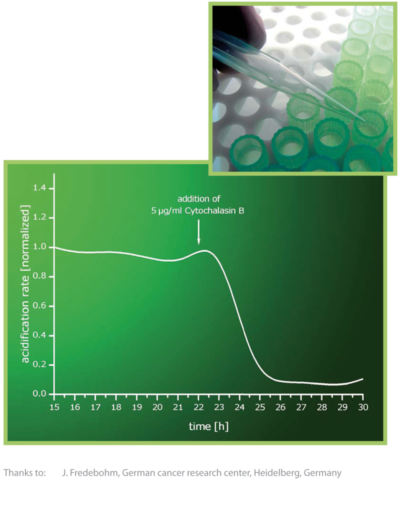 Cell based assays are useful tools for basic research in the field of cell biology. The example shows the interaction between the drug Cytochalasin B and living cells.